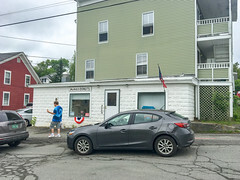 Muriel’s is a bit of a shibboleth for separating the seasoned Upper Valley residents from visitors or new arrivals, since it’s not exactly the most prominent of businesses. Instead of being located downtown or in one of the area’s business districts, Muriel’s is tucked away in the basement of an apartment building in a quiet residential neighborhood behind Sacred Heart Catholic Church; a nice little neighborhood of old mill housing and small homes that, unless you are seeking donuts or visiting someone, you probably had no reason to visit. 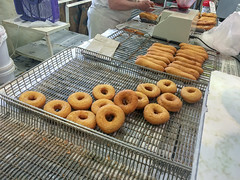 But inside that basement, behind the modest storefront, Muriel and her family have been cranking out some excellent donuts for over 50 years (they opened in 1967). 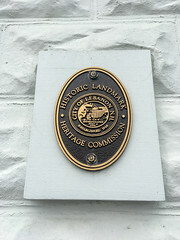 Heck, the place is actually a recognized “Historic Landmark”. Muriel’s has some challenges: in addition to finding the place, it’s got limited hours: nominally 10am to 1pm, although my experience is that you need to add an “-ish” to those time. Muriel herself primarily runs the place, with the help of family (she used to be helped out by her husband who would open the place and deal with the early morning crowds, but he passed away recently), and on a daily basis she’ll make up between 30 and 60 dozen donuts, all hand-rolled and cut (on an impressive, ancient butcher block), cooked in small batches in 100% pure lard, and then, for the filled or powdered varieties, prepped to order as customers ask for them. 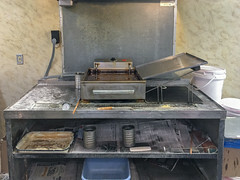 But after a short wait in line (there’s almost always a line), you get to the front, you order up your donuts (right now, at $9 per dozen), and if you order jelly sticks, even get to see Muriel run the little gear-fed machine that injects each jelly stick to order. Then, you get to take your bag of donuts, already showing the grease stain, back to your car. Indeed, if I had to come up with one word to describe a Muriel’s donut, the word would be “fritter-like”. The batter is an almost cake-like batter that, when carefully fried in the lard, results in an exquisite combination of the slightly sweet cake-like interior yielded to a shockingly light and crispy exterior (as much as one can use “light” describing something soaked in lard). In short, it’s donut excellence of a unique sort: I’ve had many a great donut over the years here at Offbeat Eats, and while Muriel’s isn’t always my favorite (for example, Muriel’s doesn’t do glazed or frosted donuts), it’s a uniquely good variant of the class bakery good. 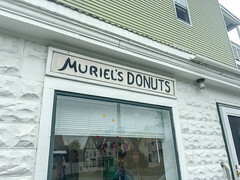 In short, Muriel’s donuts are worth seeking out. 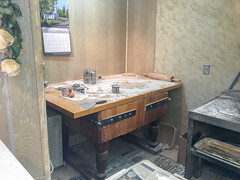 (And, for more info, the Valley News did a great article on Muriel’s back in April). Muriel is my mother in law. I love this article, however, would like to make one correction. Muriel did lose her husband who she’s been with since age 17 and sadly 6 mo later lost her oldest son Doug. Most recently her son Mark passed from cancer. She does still have 3 living boys, Jeff, Dan and Chris. Thank you! I’ve just edited the article, and glad to hear her family is doing well otherwise. (Closed) I’ve had a rather strong love of Vietnamese food since discovering it in the early 1990s. And I’ve been relatively blessed to have some decent places to get Vietnamese food in most of the places I’ve lived. East Lansing, MI wasn’t exactly a culinary mecca, but it did have Saigon Restaurant, which was a reliable source of Phở for my college years. Minneapolis was chock full of Vietnamese (and Cambodian) places, most of them very delicious. And I’ve even enjoyed watching the demographics of my parents’ neighborhood in Arizona change, with several good Vietnamese places popping up within a mile of their house. Northern New Hampshire, however, is basically bereft of Vietnamese food. When we moved here, we discovered that not only did the area not have any Vietnamese restaurants, but almost nobody up here even knew what Vietnamese food was. After some web searching and talking around (including a brief period at work where I had a Vietnamese coworker), we discovered the unfortunate fact: Vietnamese food required traveling at least to Nashua to the Southeast, or Williston to the Northwest, in order to find a Vietnamese place. So we hopped in the car and checked things out. Fast forward almost a dozen years, and the situation isn’t much changed. You can actually buy sriracha sauce in the stores now. And Golden Bowl now offers Phở in Manchester, NH. And quite a few places have come (and gone, even) around Burlington. But generally, that means a craving for Phở, cha gio, or any other Vietnamese food requires a road trip. So this weekend, when we found ourselves passing through Nashua after a weekend shopping trip, we decided it was time for another visit to Vietnam Noodle House.